Contains the premium active ingredient Bromethalin, excellent for proven control of high rodent populations and severe infestations. Bromethalin is an acute, non-anticoagulant active that will begin to kill rats & mice in 2 or more days after consuming a lethal dose, faster than anticoagulant baits. Kills by affecting the rodents’ nervous system – Bromethalin is an ATP Inhibitor, which prevents the transfer of energy across nerve cells. Due to a quick knockdown when compared to anticoagulants, more rodents can be controlled with less bait. 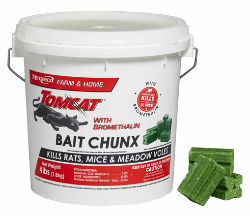 Motomco's unique, proprietary extrusion process produces Bait Chunx with multiple edges that appeal to a rodent's desire to gnaw. Chunx are made with food-grade ingredients and small amounts of paraffin for a highly palatable bait. Formulated with an optimal blend of ingredients and low wax content for maximum palatability and weatherability. Mold and moisture resistant. Contains holes for placing on rods in a bait station, or can be secured using nails or wire. Each block kills up to 12 mice, based on no-choice laboratory testing. Good for severe infestations.